May 26, 2016 at 6:42 pm. In order to keep up with the ever increasing amount of information created in a digital era, brands need to constantly evolve. While businesses continually strive to better reflect the needs and interests of consumers across new, digital platforms, more and more content is being created—so much so that a daily New York Times now contains more information that the 17th century man or woman would have ever encountered in a lifetime. (Source) This overabundance of data forces marketers today to constantly rethink the ways in which they create, organize and distribute data in order to better connect with their audiences. The cost of all this content creation, however, comes at a price. Though the average American spends about 4.7 hours a day on their phones, the average time spent reading content on a web page is an astonishing 15 seconds. Understanding the problem of ever-decreasing consumer attention—aka “content shock”—then becomes a central issue for brands looking to engage more meaningfully with their audiences. Creating great content is hard. Combined with the fact that many brands don’t often have content creators in house (or the budget to hire them), businesses often turn to outsourcing content creation as a solution. The problem with this approach, however, is that it creates a system by which content creation tools become too disparate and hard to manage. Add in the fact that outsourcing content often relies on the work of external third parties who aren’t versed in your business values and you’ve got yourself a recipe for trouble—namely, for content that doesn’t accurately reflect your brand voice. You could say we’ve learned a thing or two about obstacles modern digital marketers face. We’ve encountered many challenges over the past 18 years and consider ourselves lucky to say that many of them have resulted in beautiful products our clients were thrilled with. Some projects, however, failed to meet expectations. Despite adhering to budget and schedule guidelines, there were occasions in which the final product seemed somewhat disconnected from the client’s original vision. Trying to figure out exactly what went wrong wasn’t always easy, but we were determined to use these instances as an opportunity to grow and better understand how to help our clients achieve specific goals. We began to retrace our steps to determine at what stage these projects began to veer off target. In doing so, we discovered that the origin of the problem lay in the initial planning phase. It was so easy to get caught up in terms of the work we could do for our clients (the possibilities!) that the vision behind the work became muddied at times. What exactly were we trying to achieve? This became the new driving force behind all of our work. Developing a more genuine understanding of our client’s vision required taking a step back to examine the motivations behind each project—a process of review that led us time and time again to the importance of developing a solid content strategy. –Margot Bloomstein, principal of Appropriate, Inc., a brand and content strategy consultancy based in Boston. And thus, we set out to refine and further develop our own content strategy—a journey that taught us a lot about ourselves in the process. We re-evaluated the things that meant the most to us. What did we excel at? What kinds of services and experiences did we want to provide for our clients? What we really wanted to do was to help brands find and manage the best content available. We realized then that this had given us a decidedly new focus, and so, we decided to update our new range of services to more accurately reflects that focus. 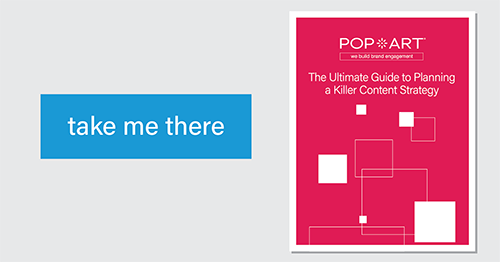 Check out our new updated service offerings below to find out how Pop Art can help you develop a killer content strategy, provide you with amazing content enablement tools for sales teams and much, much more. To learn more on how to combat content shock, get your brand noticed and how to develop your very own sophisticated content strategy, be sure to take a look at our Ultimate Guide To Planning A Killer Content Strategy.